Following their marriage in 1905, Charles and Brenda Seligman became a formidable anthropological team, researching and writing about communities in Sri Lanka, Sudan, Egypt, China and Japan, and travelling to many parts of the world together. Although Charles enjoyed a higher profile, as Professor of Ethnology at the London School of Economics, he had such a close working relationship with Brenda that it is often difficult to unpick their individual contributions to their books, and almost impossible to do so when it comes to their ethnographic collections. Charles Seligman was born in London in 1873. In 1892 he gained an Entrance Scholarship to St Thomas's Hospital. He earned his first medical qualification four years later, in 1896, and received the Bristowe medal in pathology that same year. In 1898, at the age of twenty-four, Seligman approached Alfred Cort Haddon and asked whether he might be allowed to join the Cambridge Torres Strait Expedition planned for later that year. He offered to pay his own expenses in an effort to persuade Haddon to include him despite the fact that the expedition team was already finalized. His efforts were successful and, although he initially joined as a pathologist and specialist in tropical diseases, he soon expanded his research into the realms of physical anthropology, ethnology and collecting work. Seligman returned to his work as a pathologist at St. Thomas's in 1899, but in 1903 he was given the opportunity to undertake a second anthropological expedition to Melanesia when he met a wealthy American, Major Cooke Daniels, while on holiday, who agreed to provide the necessary funds. This time, Seligman led the expedition team, which included Cooke Daniels and Walter Mersh Strong. In 1905, Charles married Brenda Zara Salaman. She was born in 1882 and had been taught privately at home before going to Rodean and then studying pre-medical biology at Bedford College in London. Brenda helped Charles write up the results of his work in New Guinea, and they subsequently travelled together undertaking government-sponsored ethnographic survey work in Sri Lanka (1907-08) and Sudan (1909-10, 1911-12, 1921-22), and archaeological research in Egypt (1909, 1913-14). Brenda spent her time in the field working on languages (she learnt Arabic while working in Sudan), kinship organization and genealogies, and she always took an interest in the lives of women and children. Whilst working in Sri Lanka she was able to observe rites and ceremonies among women to which men would not have been allowed access. Charles tended to concentrate on physical anthropology and material culture in the field. They shared an interest in magic and religion, and, later, in psychology and its contributions to anthropology. 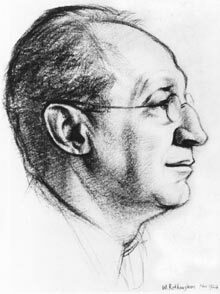 In 1910 Seligman became Lecturer in Ethnology at the London School of Economics, and three years later he was made Professor of Ethnology, but he insisted that the Professorship be part-time so that he could be free to undertake more fieldwork. During the War, he was attached to the Maghull Hospital, near Liverpool, which specialized in the treatment of psycho-neuroses of warfare. He worked there alongside a group of prominent anthropologists and psychologists: William Rivers, Grafton Elliot Smith, Charles Myers and William McDougall, and the experience prompted his own growing interest in psychology. Meanwhile, Seligman's position as one of Britain's leading anthropologists strengthened during the years following the Great War. In 1915 he served as President of the Anthropology Section of the British Association for the Advancement of Science. In 1919 he was elected Fellow of the Royal Society, and he served as President of the Royal Anthropological Institute (RAI) from 1923-25. 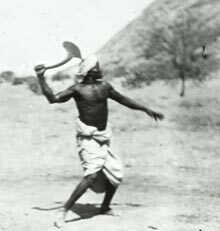 In 1925 he received the Rivers Medal, recently founded by the RAI in memory of Rivers, for anthropological work in the field. By this stage in life, the Seligmans spent much of their time at their home, Court Leys, in Toot Baldon, near Oxford. They bought the house in 1920, and it became the location for much of their socializing and intellectualizing with friends and colleagues. The Seligmans built their own museum as an extension to Court Leys, and the building still stands there today. It seems likely that their private museum played some part in this effort to inspire others and learn from them. Seligman was of the generation that believed cultural histories and relationships were evidenced in material forms and technological practices, so he considered that material culture should be at the heart of learning about other cultures. He certainly used specimens in his lectures at the LSE and he and Brenda were avid collectors throughout their lives. Japan, Hokkaido: Ainu people. 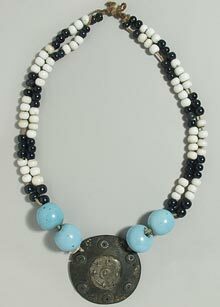 Necklace of trade beads, from which hangs a circular wooden breast-plate studded with ?silver medallions. Donated by Charles Gabriel or Brenda Seligman, 1940. The British Museum, the Victoria and Albert Museum, the Cambridge University Museum of Archaeology and Anthropology, the Pitt Rivers Museum, and the Petrie Museum at University College London, all hold collections given to them by Charles and Brenda Seligman. The Seligman collection at the Pitt Rivers Museum alone comprises over 5000 objects. Much Seligman material at the Pitt Rivers is from Egypt, but there are also large collections from Sri Lanka, Algeria, Sudan, Australia and Papua New Guinea. Collecting was an integral part of the Seligmans' field research, and crucial to their anthropological teaching and writing. In 1934 Charles resigned from his Professorship at the University of London due to increasing ill-health, and was given the title Professor Emeritus. He died in 1940. Brenda sold Court Leys in 1947 and moved back to London, where she continued to display their fine collection of Chinese and Far Eastern Art (now held at the Victoria and Albert Museum and the British Museum). She continued to develop this collection during her 25 years of widowhood, and she became increasingly involved with the work of the Royal Anthropological Institute. She served on the Council of the Institute for many years, both as an ordinary member and as Vice-President, rarely missing meetings and regularly hearing papers at evening meetings. In 1959 she succeeded A.R. Radcliffe-Brown as President of the post-war Association of Social Anthropologists. In 1963 she was the first recipient of the RAI's Patron's Medal. She died in 1965. Haddon, Alfred Cort 1934 'Appreciation' in Evans-Pritchard, Raymond Firth et al. (eds) Essays Presented to C.G. Seligman London: Kegan Paul, Trench, Trubner & Co.